Close Textual Study of the Oral Law, focusing on issues of lost items, sales, rentals, deposits and related monetary matters. 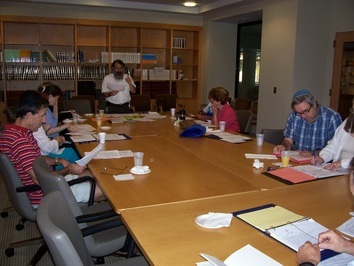 “Jewish-Christian Discussions at Southern Methodist University with Rav Hanan and Dr. Robert Hunt," Mondays, 7-8:15pm. Time and Location: Sundays, 7:30-8:45pm at Congregation Beth Torah & Wednesdays, 8:15-9:15am, at the Aaron Family JCC. Is the World Progressing or Regressing? Who is Included in the Covenant? For What Purpose Were we Slaves in Egypt? God and Moshe Lie to Pharaoh! Interfaith conversations every Tuesday at rotating houses of worship. For more information visit the FIC 'Upcoming Events' page. There is a recommended donation/fee for all classes, but no one will be turned away for lack of ability to pay.